Dutch studio Sinot Exclusive Yacht Design has developed a new 80 metre superyacht concept for Feadship, which aims to break away from the “typical wedding-cake appearance”. 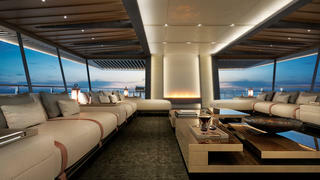 Rather than the traditional design of two lounges stacked on top of each other, Project Zen features one large saloon. The idea came about following discussions with clients who said that superyacht owners rarely use both lounges and instead spend a large proportion of their time in their favourite lounge. 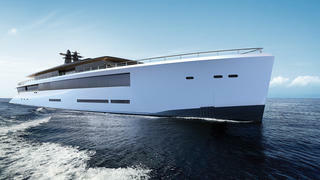 The interior of Project Zen aims to make good use of the yacht’s length over the full length of the bridge deck and the main deck. This includes a 100 square metre lounge, with side panels and aft glass corners that can open up to connect this area to the aft deck. 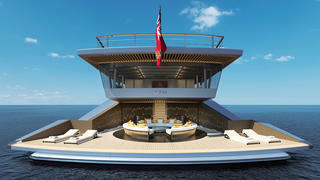 Exterior relaxation spaces on Project Zen include just under 500 square metres of deck space for sunbathing and hosting parties, including an eight-metre swimming pool, upper deck helipad and a superyacht spa pool on the foredeck. The amidships dining area features sliding doors on both sides and a skylight, adding to the connection with the exterior spaces, while the fold-out superyacht terraces provide a great spot for enjoying an aperitif. Project Zen’s interior volume totals 1,980GT and the on-board decor includes custom-designed furniture, dark woodwork, silk carpets and soft chenille fabrics. Moving forwards, the high-tech bridge area includes floating consoles and two guest settees – ideal for owners and guests who like to interact with the crew. Accommodation is for 10-12 guests with a full-beam main-deck owner’s stateroom and a choice of 4-5 VIP guest cabins. The crew quarters could be modified for a staff of up to 25, while the tender garage could hold four wave runners and three tenders measuring up to 9 metres. The studio adds that this all-aluminium superyacht concept has been developed in close collaboration with Feadship CEO Henk de Vries with a strong emphasis on practicality and cost effectiveness. 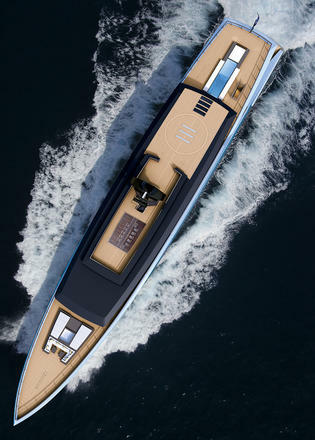 Power would come from a Caterpillar diesel-electric powerplant for a top speed of 18 knots and silent cruising at ten knots.